In response to my recent blog post on Relationship trees drawn like real trees, what is probably the earliest genealogical tree of languages has been pointed out to me by Johann-Mattis List. This is an obvious omission from my earlier post, which suggested that the earliest such tree was published in 1853; and so I have reproduced it here. by Félix Gallet (c. 1800). There seems to be little information available about the origin of this figure. It is undated, but is apparently from the period 1795-1800, which would also make it the first "tree drawn as a real tree", slightly predating Augustin Augier's tree from 1801. It is a single engraved broadside sheet, rather than a figure in a book, and only two examples seem to be known, one in the Bibliothèque Nationale de France (see the auction catalogue #1441 by Maggs Bros) and the other recently acquired by Princeton University Library (see the blog post by Julie Mellby). 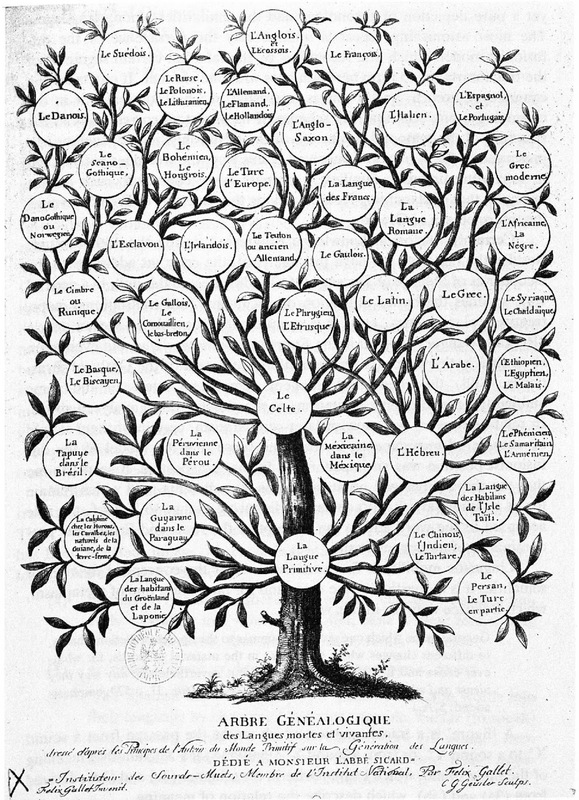 Félix Gallet's use of the title "Arbre Généalogique" [genealogical tree] makes the phylogenetic context of the figure clear. The tree representation may be a response to William Jones' suggestion of a historical relationship among Indo-European languages, notably in his 1786 book The Sanskrit Language, in which he suggested the possible historical affinity of Sanskrit and Persian with Greek and Latin: "they came from a common source, which perhaps no longer exists." This is usually considered to be the first addition of a historical component to the traditional spatial (geographical) one of comparative linguistics. What is more important to us, in this blog, is that the tree is clearly a network, as several of the languages are shown as hybrid developments of other languages (eg. Etruscan, French, Greek, Latin). Many of the suggested relationships are no longer accepted, of course. For example, Swedish is derived from German (as shown in the tree for Flemish and Dutch) not Runic, and English is now considered to be a classic example of a hybrid language (originally Germanic but now with extensive Romance influence via French; see, for example, the blog post by Seth Long). Indeed, Sylvain Auroux (1990, pp 213-238 in Leibniz, Humboldt, and the Origins of Comparativism ed. 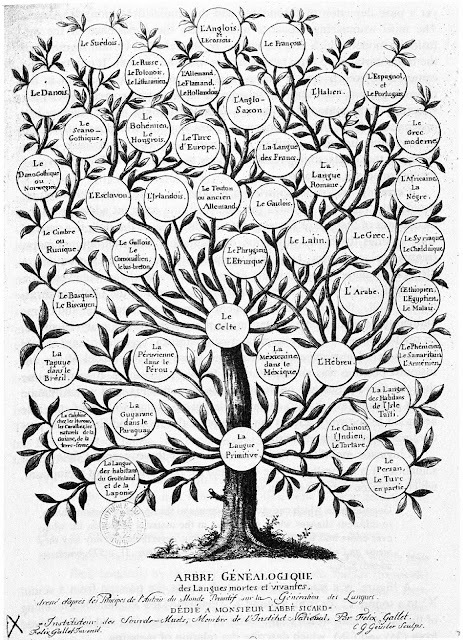 Tullio De Mauro and Lia Formigari) has noted that Gallet's tree is an intermediary between modern genealogical ideas about language history and the preceding interest in spatial comparisons of languages, along with the Biblical-scholar tradition that all European languages derive from Hebrew (via the story of the Tower of Babel): "The location of the branches of the tree is no longer totally geographical, nor is it yet a pure depiction of chronology and the similarities among languages." Indeed, Auroux has a rather poor opinion of the tree in general: "the tree is of astonishingly poor quality given the period in which it [was] executed." Of equal interest to us is the parallel historical pattern of network-thinking in biology and linguistics. The first two depictions of genealogical history in biology (in 1755 by Buffon and 1766 Duchesne), both displayed hybridization as an important component of history, just as did Gallet for linguistics in 1800. In both disciplines, this early lead was later side-tracked by non-reticulating tree iconography in the mid 1800s, by Charles Darwin in biology in 1859 and by August Schleicher in 1853-1861 in linguistics. Finally, in both cases there is now a burgeoning interest in returning to network representations of genealogy, particularly if the analyses can be formalized mathematically. Thus, there are more parallels between the two fields than is suggested simply from a study of tree thinking alone (for which, see Platnick and Cameron 1977 Systematic Zoology 26: 380-385; Atkinson & Gray 2005 Systematic Biology 54: 513-526; Pagel 2009 Nature Reviews Genetics 10. 405-415). This mathematical model of language death shows the standard thinking: when linguistic populations come into contact, one eradicates the other (through cultural assimilation), or both exist separately (through cultural separation, e.g., the Basques in Spain). So, the assumption is that linguistic contact never produces offspring and you thus don't need to worry about modeling a phylogeny full of nodes that have two parents. This assumption is obviously false in some cases, especially phonologically and lexically. Most Romance languages had some input from barbaric languages; similarly, when all those Global Englishes evolve into something new, it will be absurd to model them as direct offspring of English, as though they had no relationship to, say, Hindi or whatever.